The oral cavity, pharynx, and larynx constitute the main components of the anatomic upper airway structures that underlie respiration, swallowing, and phonation in humans. In children, the upper airway is greatly influenced by the growth and development of the head and neck structures along a temporal continuum spanning from the neonatal period through the end of adolescence. 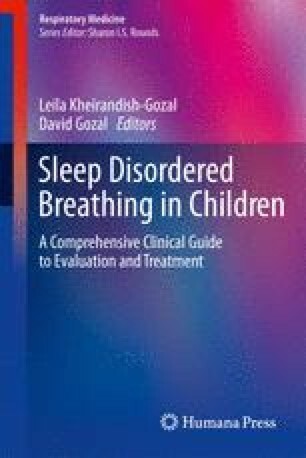 The obstructive sleep apnea syndrome (OSAS) in children refers to a disorder of breathing during sleep that is characterized by either partial or complete upper airway obstruction during sleep, and that is commonly associated with intermittent hypoxemia and hypercapnia, as well as sleep fragmentation. In humans, the upper airway can be conceptually represented as a flexible tube with a collapsible segment. It is now established that anatomic narrowing and increases in the collapsibility of the upper airway predispose to OSAS. OSAS affects subjects of all ages, from infants to the elderly. However, the clinical manifestations, predisposing factors, and patterns of polysomnographic data in children with OSAS are different from those in adults. In addition, the upper airway of children has considerable anatomic differences from that of adults. Therefore, to understand the pathophysiology of OSAS in children, it is very important to fully apprehend the anatomic features and developmental characteristics of the upper airway structure through childhood. This chapter focuses on the normal upper airway structure and on the developmental characteristics of the upper airway anatomy in children.